As President Donald Trump introduces a series of budget cuts and regulatory rollbacks that would cripple the Environmental Protection Agency, he faces one unpredictable obstacle: resistance from fellow Republicans. 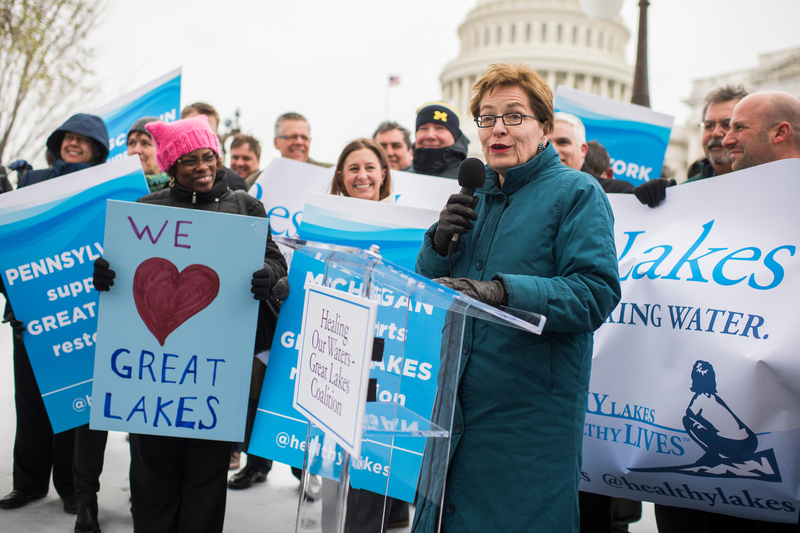 A small but vocal number of GOP lawmakers have rallied in support of popular programs in their districts, including clean water programs in the Great Lakes and the Chesapeake Bay, that are among the biggest losers in the budget Trump proposed to Congress last month. Such statements stand in stark contrast to Trump’s campaign promise to “get rid of” the EPA by slashing staff, closing regional offices and rolling back environmental regulations — an idea that many Republicans have peddled for years. They offer one example of a slew of disagreements within the GOP over the core principles represented by the Trump spending plans for fiscal years 2017 and 2018, which propose deep cuts to popular domestic programs in order to pay for increases in the defense budget. At the EPA, roughly 3,200 positions would be eliminated — about a fifth of the agency’s work force — along with 50 programs. Congressional appropriators from both parties have panned Trump’s request, pointing out that they — not the president — are the ones who determine the final budget. But environmental advocates are nonetheless concerned that with so many cuts proposed, some will almost certainly stick. “I can’t imagine that Congress is going to go along with these cuts,” said Bill Becker, executive director of the National Association of Clean Air Agencies. He pointed out that the conservative argument that environmental regulations should be left to the states is also belied by a March request from the administration that called for a 30 percent cut to state grants. “My fear is that the administration has just thrown slop at the wall and some of it will remain,” Becker said. Moderate GOP members or those with environmental problems in their home districts have so far been the most vocal opponents of Trump’s proposed EPA cuts. But Adrian Gray, a right-leaning political consultant who worked for the George W. Bush administration and the Republican National Committee, said many more could have reason to be concerned. His research shows that, across the country, GOP voters care about environmental issues. That’s one reason major environmental actions such as the creation of the EPA and the Clean Air Act of 1970 happened under Richard Nixon, a Republican president, he said. Many Republicans are also strongly opposed to cuts to environmental programs — including in regions considered “Trump country,” Gray said. A survey Gray conducted in late March in regions that Trump carried last fall showed that 70 percent of voters said climate change is a “very” or “somewhat” serious problem. Of the 58 percent of voters who had heard of Trump’s efforts to reduce environmental regulations, 51 percent said it had lowered their opinion of the administration. And while 26 percent said they wanted a rollback on protections that have “become a burden on manufacturing jobs,” 66 percent said they wanted “environmental protections” to remain in place. Typically, voters don’t base their decisions at the ballot box on environmental issues, Gray said. But if a piece of legislation puts the topic in the national spotlight or if there is an environmental catastrophe — such as an oil spill or a destructive storm — that could change quickly, he said. “Then it’s a whole new ballgame for Republicans, and they’re probably looking at some real costs, not just to a couple of members who have a thorn in their side — some real political costs,” Gray said. For now, members in coastal regions, areas where the economy is tied to the outdoors, or regions with a large block of evangelical voters who believe it’s “their duty to protect God’s earth,” are bound to suffer the most if voters feel their party has abandoned the environment, Gray said. But environmental advocates, sensing a potential line of attack, are ready to pounce on anyone who stays silent on the cuts. So it’s no wonder that, as news circulated about Trump’s budget proposal, the bipartisan Climate Solutions Caucus added a handful of new GOP members — expanding to 34 members, half of whom are Republican, according to the group’s charter. Five Republicans joined 12 Democrats to sign a letter to Trump stating their support for a program devoted to cleaning up the Chesapeake Bay. And seven Republicans were among 20 signatories of a similar letter about the Great Lakes. The latter two programs are slated to be eliminated under Trump’s budget proposal, but they have received such an outpouring of bipartisan support that advocates believe they will be spared. Among the most vocal opponents of the cuts is Republican Rep. Carlos Curbelo, the co-founder of the Climate Solutions Caucus, whose South Florida district is threatened by rising sea waters and includes the Everglades. “I’m very confident an overwhelming majority of the Republicans are going to get on the record against these types of proposed cuts,” he told Environment and Energy Publishing last month. Other members have been more selective about their criticism. Rep. John Moolenaar was one of the signatories of the Great Lakes letter. The Michigan Republican has criticized the EPA for regulatory “overreach,” and came out last week in support of Trump’s executive order that would roll back President Barack Obama’s efforts to curb global warming. But when a group of Great Lakes advocates made an in-person appeal in his office recently, he expressed his support in no uncertain terms. “I’m going to be an advocate for this,” he told them. His wife grew up on Lake Michigan, he said. He vacations there. And he said he knows how important tourism is to the region’s economy. Rep. Andy Harris, a Maryland Republican, decried the proposed cuts to the Chesapeake Bay Program but stressed he has voted for cuts to the EPA’s budget every year he’s been on the Appropriations Committee. He said he believes the EPA serves a valuable role on issues that affect multiple regions, but that authority over local issues is best left to state and local governments. Lee Zeldin, a two-term GOP congressman from Long Island, has a history of voting against environmental issues, according to rankings published by The League of Environmental Voters. But he is pushing back against Trump’s proposal to defund a clean water program in the Long Island Sound. He wants the budget increased. “There are millions of people who live all around the Long Island Sound, putting aside the countless number of wildlife impacted by the quality of the water,” he said. Such arguments correspond with the traditional Republican viewpoint that the environment is generally a local issue — compared to Democrats, who see it as a global one, said Gray, the political consultant. But that standpoint irks environmental advocates, who call it hypocritical.